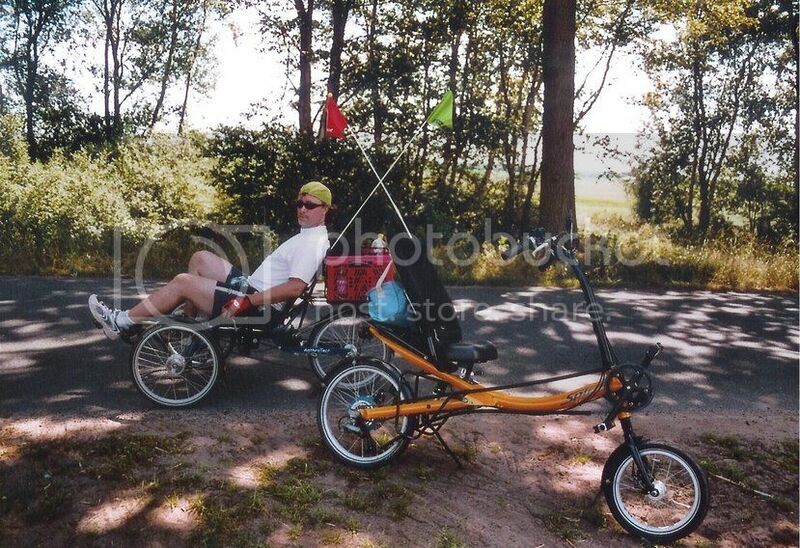 recumbent adventure! : Whoa! Time flies when you are having fun. Whoa! Time flies when you are having fun. Everyday life has caused me to completely forget about the BikeBlog, but hopefully some future free time will change that. I've just recently purchased the vehicle of my dreams: an Anthrotech trike! 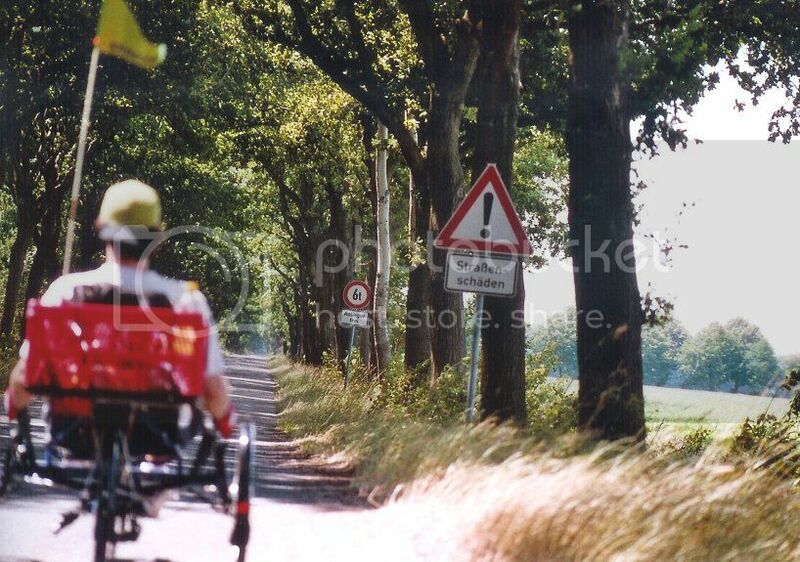 In the photo to the right you'll see me on the trike, with the girlfriend's rented Spirit semi-recumbent in the forground. She has much better suspension, but I gain more stability in varying road conditions. Year-'round cycling is certainly possible with the trike. Unloaded, the trike is not much heavier than my previous mount, the Aprilia racing mountain-bike used for the Germany-to-UK ride in 2003. With a 24-speed gear system, hills under load are no problem - a bit slow, but far more comfortable than climbing with an upright. For being two years old, it's also in surprisingly good shape. I've only needed to have the hydralic drum brakes bled to eliminate air-bubbles that have crept in while it was sitting in the shop un-used for so long (only used occasionally as a test bike for customers), and one of the front wheel mudguards adjusted. Otherwise it was ready to go. Holding speeds of 20-25 km/hour are no problem with the trike, as the lower-to-the-ground-and-reclined position give me a decent aerodynamic profile than an upright. This winter I may consider purchasing a windshield that covers my legs. HP Velotechnik's Streamer is said to do a great job in cutting the wind and increasing your cruising speed. As with all new toys, I'm already planning certain modifications. First up is to replace the twist-grip shifters with Shimano-style thumb-shifters. The twist-grips work just fine, but changing gears while making turns can be a bit uncomfortable - especially if I need to downshift quickly in preparation to stop. Thumb-shifters solve that problem for me. Second mod is the addition of side mirrors and bike computer. Experience with the Aprilia proved to me that big mirrors make it far more comfortable to see around and behind me without needing to twist my body around to look. Granted the trike's stability makes that easier, but it can be safer and quicker to just glance at a mirror to see who/what is coming up behind me. The addition of the bike computer is just to see my speed and distance travelled. Nothing fancy there. Third mod is a larger project, and a pre-cursor to the windshield: a rag-top. Current idea is to add a second flag, add a piece of fabric that i can slide up and down the flag-poles, then pull this covering over my head, mounting the front (flag-end) with a cargo-strap to the center of the bike (between my legs) or to either side of the seat mounting brackets. To 'put the top down' is just a matter of releasing the front mount, letting the flags return upright, then sliding the fabric down behind my head. I might get lucky and the fabric could work out as a head rest too. Fourth mod is far into the future: an electric motor. There are currently several kits that will mount to the Anthrotech, so I forsee no problems or major challenges there. The motor would be primarily for steep hill climbs or giving the legs a break on long flat areas (some motors with the right gearing can give you 30+ km/h cruising speeds for a couple of hours). A small gas engine (like from a gas-powered weedeater or leaf-blower) is also a candidate. This will depend on weight and if an engine could be mounted to the bike to take advantage of the gear system. This would essentially turn the trike into a 3-wheeled motorcycle, so a license may be needed. But as said before, this 'mod' is well into the future, and may not even happen on this particular trike. Enough babbling for now! More trike adventures to come!